Marshall Claxton travelled to Australia seeking greater demand for his work, despite his reasonable success as a painter in England. He held an exhibition in Sydney, which resulted in numerous portrait commissions from clergymen, government officials and members of prominent Sydney and country families. 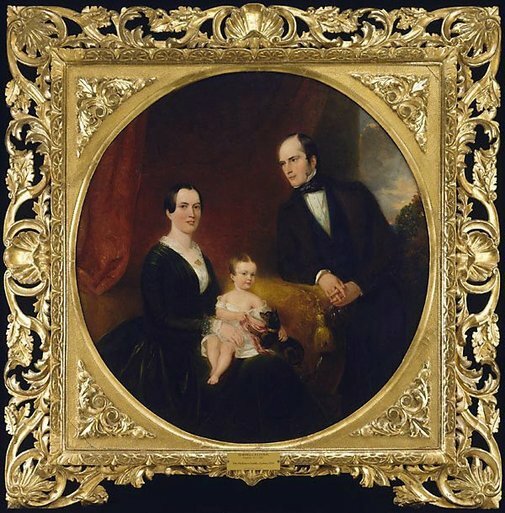 This family portrait depicts Sir John Nodes Dickinson, his wife, Helen, their baby daughter, Helen Mary, and the family dog, Tiny. English-born Dickinson came to Australia to take up his appointment as a judge of the Supreme Court of NSW in 1844. In 1852 he commissioned Claxton to paint another portrait of his daughter Helen Mary Dickinson, who became a major patron of the Art Gallery of New South Wales. Art Gallery of New South Wales picturebook , Sydney, 1972, 68 (colour illus.). Steven Miller, Look , 'A dog's life', pg. 18-19, Sydney, Dec 2015-Jan 2016, 18 (colour illus. ), 19. Steven Miller, Dogs in Australian art , 'Miniature pinscher', pg. 144-145, Kent Town, 2012, 144 (colour illus., detail), 145 (colour illus.). Catalogue of the National Art Gallery of New South Wales 1899 , Sydney, 1899. cat.no. 196, Oil Paintings-Copies of Old Masters, titled 'Sir John N. and Lady Dickinson, Miss Helen Mary Dickinson (1851)'. A catalogue of Australian oil paintings in the National Art Gallery of New South Wales 1875-1952 , Sydney, 1953, 45.